A brightening and lightening serum that gives you noticeably fairer, smoother and healthier looking complexion. 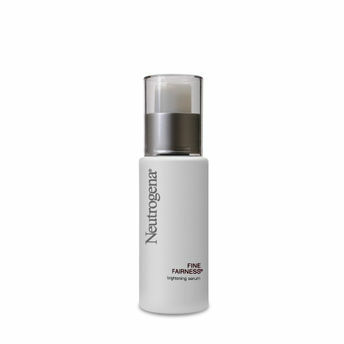 This wonder serum by Neutrogena absorbs easily into your skin and refines your skin texture. Infused with Neutrogena Healthy White Complex which is known to inhibit the production of melanin, the serum gives your skin a healthy and radiant glow. Over regular use you get visibly improved skin tone and texture. Additional Information : Keep your skin fresh and healthy using Neutrogena Skin Care products.The No.1 Dermatologist recommended skincare brand part of the Johnson & Johnson Family of Consumer Companies, offers a wide range of skin and hair care products.From the transparent amber bar to a diverse collection of ingeniously designed, doctor-recommended products, Neutrogena's heritage is founded upon genuine relationships and a passion for designing simple yet extraordinary, high quality products that earn your trust. Explore the entire range of Serums & Essence available on Nykaa. Shop more Neutrogena products here.You can browse through the complete world of Neutrogena Serums & Essence .